As you can see from the photo below, the ice-cream turned out nice . The flavor pairing of fresh mangoes and the mango flavoured yoghurt , with the added sweetness of the sugar, is just so very right…….. except that I read the instruction wrongly. Instead of whisking the non-dairy whip cream to THICK , I whipped it till STIFF ….. the ice cream texture turned out a bit stiff. So , please be careful when doing this part…do not whip the cream till STIFF. This is a fantastic recipe…….will try making this again…and this time , I have to remember not to whip the cream till STIFF. 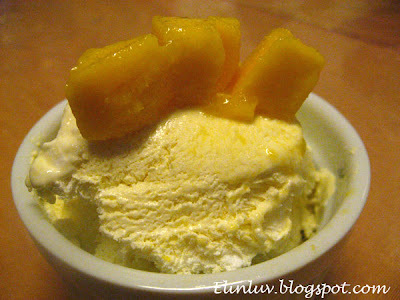 (1) Blend mangoes and sugar together until it becomes puree. (2) Whisk non diary whip cream until thick. (3) Mix yoghurt with mango puree and then fold in whipped cream. (4) Pour into a container and chilled overnight . (5) Pour into ice cream maker and churn till it thickens . Freeze in freezer for 2-3 hours and serve with mango slices.